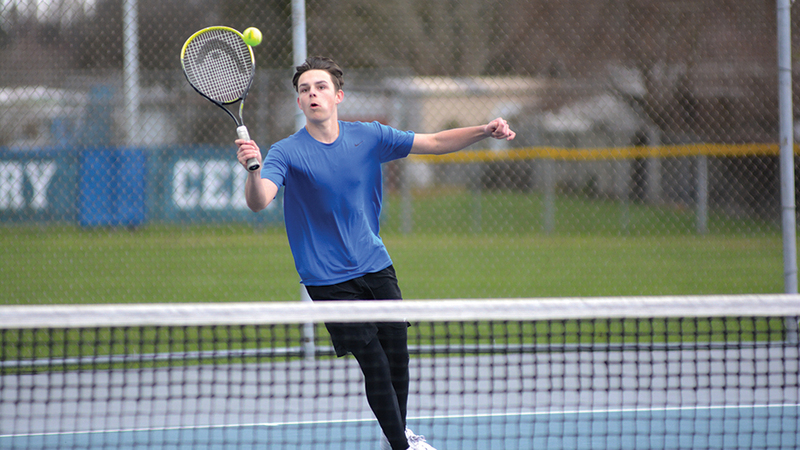 McNary’s boys tennis team won’t be the most experienced bunch in the Greater Valley Conference. But the Celtics are already proving to be quick learners. Brayden Lyda, a basketball player, and Emil Salmhofer, a soccer player from Austria, didn’t pick up a tennis racket for the first time until two weeks before the season. But Lyda and Salmhofer won their first match, 6-2, 6-1 at No. 2 doubles on Thursday, March 15 against Aloha. “We practiced pretty hard these last two weeks and it paid off,” Lyda said with a giant grin. Lyda had watched Alfredo Villarreal, a basketball teammate, play tennis last season and thought it looked like fun. McAvoy, a long-time tennis coach in the district at McKay and North Salem, is back for his second stint at McNary. The Celtics have 15 boys on the team this season from four different countries. McNary has three exchange students—Salmhofer (Austria), Pong Sae-ku (Thailand) and Zamour Sieben (Germany). “People are going to accuse me of traveling the world to recruit but it just landed in my lap,” McAvoy joked. Two returning players, Adam Graneto and Villarreal, both juniors, opened the season at No. 1 and 2 singles for the Celtics. Sieben is playing 3 singles and Luke Skipper, a freshman, is at 4 singles. Matt Dice and Noah Kuhl make up McNary’s No. 1 doubles team. McAvoy convinced three of his freshmen basketball players to try tennis—Tristan Proctor, Ben Roth and Kyle Martin. Roth and Martin opened the season at 3 doubles. McNary lost its first match 5-1 to Aloha but Skipper led 6-4, 1-0 when his match was called due to rain. Sieben was also unable to finish after losing the first set 4-6 but winning the second 6-2. The Celtics are back home Tuesday, April 3 for a league match against McKay at 4 p.m.